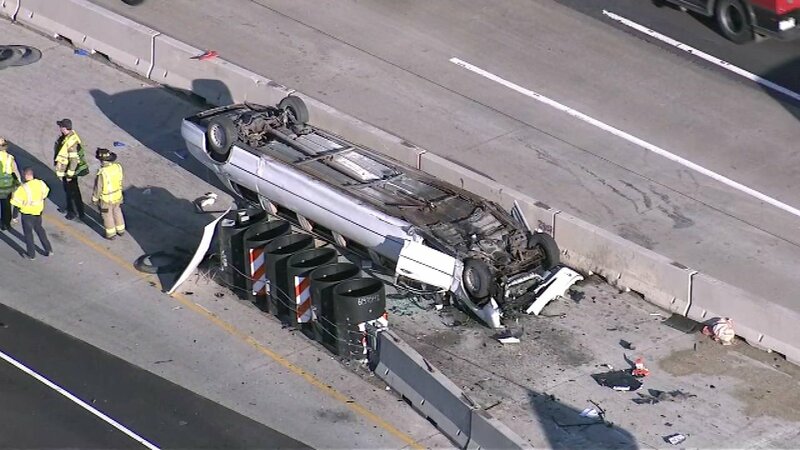 ELGIN, Ill. (WLS) -- A 53-year-old woman from Wisconsin was identified as the person who was killed in a rollover crash involving a limo on eastbound I-90 in west suburban Elgin last week. Illinois State Police identified the victim as Teri L. Schmidt, of Monona, Wis.
She and five other people, ages 45-64, were riding in a limo Friday morning, on their way to O'Hare International Airport. They were heading to Mexico for vacation. State police said the 20-year-old driver of the white Lincoln Town Car was blinded by the sun on eastbound I-90 near Route 25 around 7:10 a.m. The driver struck a concrete divider, which caused the limo to flip over. It landed on its roof. Off-duty Streamwood firefighter and paramedic Chris Tierney was four cars behind the limo when he witnessed the wreck. He used a hammer in his truck to break the windows of the limo to help get the injured out, actions he say were just instinct. Tierney said flames were shooting from the hood of the overturned limo. He said construction workers helped him with the crash victims as they waited for emergency crews to arrive. Schmidt was fatally injured. Tierney tried to save her. The injured were rushed to Sherman and St. Alexius hospitals for treatment. The driver was interviewed by state police. No citations or charges have been filed. Investigators are looking into whether speed or road conditions may have also been a factor in the crash.